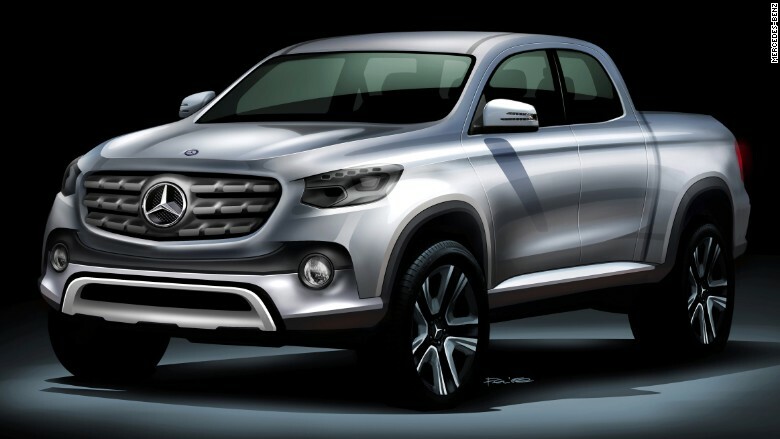 This sketch, provided by Mercedes-Benz, shows what a Mercedes-Benz pickup could look like. Mercedes-Benz plans to sell a midsized pickup truck by 2020, the luxury automaker announced Friday, calling it "the first pickup from a premium manufacturer." The truck will initially be sold in Latin America, South Africa, Australia and Europe. In those places, according to Mercedes parent company Daimler (DDAIF), there has been sustained growth in the pickup market. "We can perfectly serve customers looking for a vehicle that offers a high level of utility and at the same time has the comfort, safety, and design of a Mercedes-Benz passenger car," Volker Mornhinweg, Head of Mercedes-Benz Vans, said in a statement. "We will design our brand's first pickup according to this recipe for success." The truck will be produced and sold by Mercedes' Vans division which makes work vans that are sold globally. Despite its association in the United States with luxury cars, Mercedes-Benz also sells commercial trucks around the world. Mercedes was one of the first luxury manufacturers to enter the luxury crossover SUV market with the introduction of the M-class SUV in the 1990s. The G-class SUV, a more rugged off-road vehicle, has been in production since 1979.